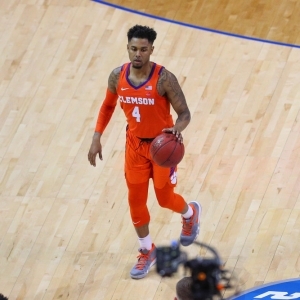 The Clemson Tigers went to the NCAA Tournament last year for the first time in seven years, and by reaching the Sweet 16 they broke a 21-year streak of not winning a game in the tournament. Now they are back with an extremely old and experienced team - all five likely starters were key parts of the rotation last year, including three redshirt seniors and a plain old senior. But the team is also facing expectations as a ranked team heading into the season. That's not a very common feeling for this school on the hardwood. Are they up to the challenge? Despite having a veteran starting lineup, the team did lose some key guys. In fact, their rotation really went just eight players deep last year, and three of the eight graduated. Guard Gabe Devoe, the second-leading scorer, and Donte Grantham, who was tied with Devoe in points but missed the second half of the season after tearing his ACL, are both gone. So is grad transfer Mark Donnal, who played a smaller but still impactful role for the team after transferring from Michigan. Together they have to replace 39.1 points and a lot of minutes. Grad transfer Javan White, a center with decent-but-not-flashy numbers at Oral Roberts, will get chances to play off the bench. Freshman guard John Newman is the most likely of the new recruits to have a big impact. The Tigers like to run three-guard looks often, and he is the most likely guy off the bench to be used in them. Wing Hunter Tyson is a shooter who will find some minutes if he can find his touch. And Trey Jemison, technically a power forward, is the tallest guy on the court. If any youngster will redshirt, it will be him. Marcquise Reed and Shelton Mitchell, both redshirt seniors after transferring into the program earlier in their careers, make up the backcourt. And they are a very solid duo - one of the best in the ACC. They averaged a combined 28 points and 6.9 assists last year. It is a quietly-strong backcourt, though depth is a concern with just two young guards on the bench. Both averaged more than 33 minutes a game last year and will have to again here. An injury to one would be devastating to the team. Senior Elijah Thomas was a five-star recruit back in his day, but it was only later last year that he started to show that potential on the court. If he can continue to build on that, while hopefully playing more than the 25 minutes he averaged last year, he could be sitting on a strong season. And redshirt senior David Skara has an interesting story. He left the team after the season last year to play pro in Europe but changed his mind and came back for another go. He had the least impact of any of the rotation members - 3.3 points and 2.8 boards in less than 20 minutes. There is a big opportunity here for him to grab with a lot of open minutes. If he can do so, he could have a career year. And the final likely starter is Aamir Simms, who originally wasn't playing much as a freshman but saw his time spike when Grantham went down. He played fine enough and should take a sophomore leap. It's not a bad group all in all, but it is tough to see where the scoring of the departed players is going to be replaced, and the bench is largely more of a hope and a prayer than a sure thing. The bench is a concern because the Tigers are a team that plays relentless defense, but that will be harder to do consistently without reliable depth. Guys like White, Newman and Tyson will really have to step up in a meaningful way in a hurry off the bench for this team to reach their potential. This is a soft, soft nonconference schedule for the Tigers. Their preseason tournament is the Cayman Islands Classic, where their toughest opponent would be Creighton or Georgia - hardly tough this year. In the ACC-Big Ten Challenge they drew a decent-but-not-overwhelming Nebraska team, and they host. They play a rivalry game at South Carolina but should be much the better team. Their only really tough game is against Mississippi State, and that is on a neutral court to limit the challenge. If Clemson plays reasonably close to potential, then they could be favored in all, or all but one, game before ACC play. The ACC, of course, is a different story. They open up at Duke then at Syracuse, so they plunge right into the deep end and could easily be 0-2 in conference play before even blinking. Then they play Virginia at home, so the hole could be deep to start. They don't play Duke again, and only play Virginia and North Carolina once each as well, so it could be worse. But .500 is an accomplishment for a lot of teams in the conference, and they will have to be sharp to better that. Ranked 22nd in the AP poll, Clemson is the co-28th choice to win the national title at Bovada at +10000, so oddsmakers are slightly less optimistic than voters. With the experience and the easy nonconference schedule, the floor is fairly high. But a lack of depth, the scoring concerns, and a deep conference make it tough for me to get hugely excited. I think they are very likely a tournament team, but I am not convinced that they are any better than last year and perhaps aren't as good. I would be a little surprised if they ended the season ranked.